One of the most common issues I find during a home inspection is poor or inappropriate dryer exhaust venting and materials. While it’s important to clean the lint out of the filter every time you finish a load, it is equally important to be aware of how clean your dryer vent is and the type of exhaust vent materials that is being used. The fibers in clothing create lint, and over time the pieces of lint that escape through the filter in the dryer can build up, leading to a potentially dangerous fire hazard, especially if any part of your dryers exhaust vent is made of a flammable material. The use of the white vinyl flex pipe which many homes still have installed is all but completely prohibited. 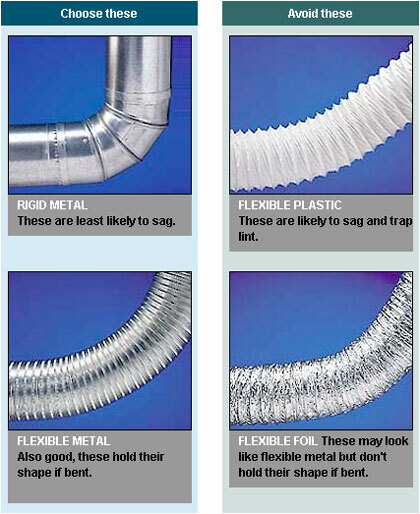 Some municipalities still allow or do not discourage the foil covered vinyl flex pipe, but almost all appliance manufacturers insist on the use of a metal type flexible pipe. What have you got ? Unless otherwise stated by municipality or manufacturer. The transition hose between the dryer and wall outlet should be a rigid metal or flexible metal type. Do not use plastic/vinyl hoses for any part of the exhaust venting. Exhaust ducting must be a minimum 4” in diameter with a run of no more than 25’ from the appliance (deduct 5’ for each elbow and 2 ½‘ for each 45). Concealed ducting must be rigid metal, and the pipes shall be assembled together with the male end of the duct pointing in the direction of airflow. To hold the ducts together metal tape (do not use duct tape) should be applied around any joints. No penetrations like screws/rivets should be used at the joints or anywhere else as these will encourage lint collection inside pipe. On an exterior wall, the vent shall have a secured hood that points downward and is complete with back draft damper. If venting through the roof an approved cap with back draft damper is required. The damper keeps out cold air and pests. Screening should not be installed at the termination point or be part of the hood / cap as this will allow lint to build up and block the opening quickly. Dryer venting is never to be combined with any other venting source. Make sure your ducts and transition hoses are made out of non-flammable material. Replace all vinyl type ducting/hoses with the appropriate metal type. Make sure the flexible transition hose from the dryer to wall outlet is not bent or crushed. The space behind your dryer should be sufficient as to provide adequate room for the transition hose to make the bends with minimal restrictions. Keep dryer exhaust ducts as straight and short as possible. Exhaust systems longer than the manufacturer’s recommendations can extend drying times, affect appliance operation and greatly enhances the probability of lint build-up inside the piping which could lead to a fire hazard. If accessible, ensure that the entire length of the exhaust duct is of appropriate material, and is venting to the exterior and not inside the home. Inspect the termination port of the dryer and look for any blockages from lint, pests or nests and remove immediately. Feel for hot air leaving the vent at a reasonable rate, and look at or feel the interior walls of the duct for any separation or blockages. Any ripped filter or cracked exhaust vents should be replaced as soon as possible. A burnt smell is apparent in the laundry room. If you are experiencing any of these symptoms your exhaust vent probably requires immediate attention. If you still have vinyl flex hose as part of your dryer exhaust venting, replace it. Replacement is relatively inexpensive and can usually be done by the home owner or a handy man without much trouble. Clean the lint filters regularly, this will save energy, improve performance and minimize the accumulation of lint inside the vent pipe. Inspect and check the accessible parts of the exhaust vent at least once a year making sure air is flowing and no accumulation of lint or any other blockages exist. If you suspect your exhaust vent is clogged or partially clogged , it is likely that you need to have them cleaned. Spending a little time and making the inspection of your dryer exhaust vent part of your home maintenance routine will go a long way towards ensuring that your dryer is operating efficiently, and will minimize the risks associated with inadequate exhaust venting. Blue Owl Inspections tests all major appliances and reports on any inappropriate venting and materials.